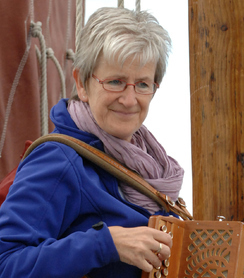 With this website, you can learn to play the accordion, also called melodeon or squeeze box. It is not necessary that you are able to read music. Using videos and music pieces on paper, it is possible to learn this at home. Actually, you will receive private lessons from your computer. Each lesson consists of 1 introductory video, which gives some information about the song and how it should be played + a video in which I play the song slowly. You can see how I hold the squeezebox and where I put my fingers. By email you will receive every week a new song + explanation. If you send me occasional your progress and problems, I can adjust the lessons specially for you. You can get phone support, also consult with a webcam and Skype is possible. You will see that the english course still is in preparation, but you can start with the Beginners course and in course of time the lessons and video's will appear in english.